In April, The New York Times published a fascinating study done by Tom Giratikanon, Josh Katz, David Leonhardt, and Kevin Quealy. 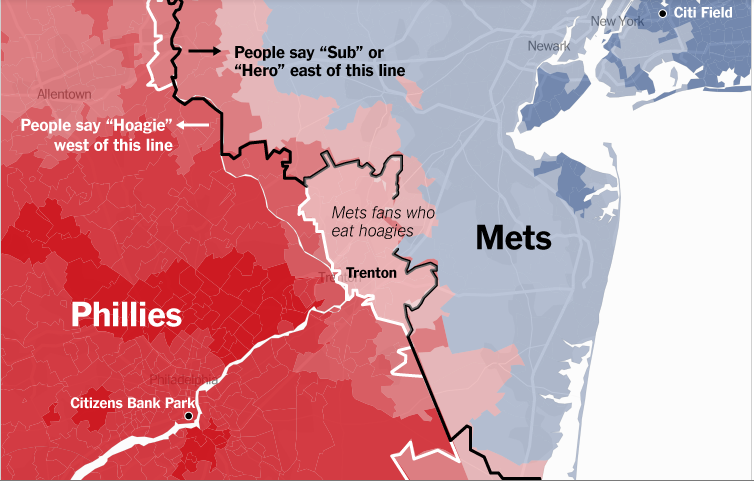 They looked at the distribution of baseball fans according to team, by zip code and county. They then compiled their data in an all-inclusive, interactive map. Facebook likes have been used before to show the distribution of baseball fans, but never in this detail. The map allows the reader to zoom in and view in each zip code or county the top 3 baseball clubs by Facebook likes. Some of the results are not surprising, but there are several interesting points that this map reveals. It is all great material for a podcast, so Paul Fritschner and I discussed this topic on The Top Step with special guest Ms. Emma Boyle as our human geography correspondent. Throughout the map, the gray area between fan nations is where the Yankees hold the largest percentage of facebook likes. And the Red Sox are generally the second most popular team in these regions. It’s interesting throughout the country to see who the third most popular team is. For instance, as we discussed the Nationals do not hold any territory in Virginia outside of the northern most DC suburbs. South of Fredericksburg, the Yankees overtake the Nats and hold the majority. But the Nats are not even the third team from points south of Fredericksburg. There, the Braves join the Yanks and Sox as the top three clubs. This is indicative of Virginia citizens outside of the DC suburbs identifying as “southerners” and not wanting anything to do with the hassle of our nation’s capital. The Orioles-Nationals line that is much closer to DC than it is to Baltimore. The O’s larger territory is due in part to the fact that Washington was without a baseball team for over 30 years. You can follow me on Twitter @smiller_96 (my feed is on the right side of this page). Of course, thanks to Ms. Boyle for her expert insight and ever-articulate analysis and the folks at The New York Times for doing this fascinating study. And make sure you keep checking back here for more posts and podcasts. Our next show should come out towards the end of next week. Thanks for stopping by. As a lifetime Philadelphian, I had never felt that the NY Mets were our rivals with the exception of the World Series pennant race in 1986. But in recent years, I experienced what a Mets fan has to cope with in our city of brotherly love. The Phillies had tamed that Mets lineup with the help of Mike Schmidt’s 3rd MVP year and even though there was no chance to catch up to them, the Phils were especially competitive. Other than that mid 80’s Mets team, they really weren’t much of a passing thought from 1975 to our present day. Other Phillies fans have a totally different attitude about the Mets fans who came to Philly to see a game at Veterans Stadium (before financial institutions named stadiums). There is no way to walk around Philly wearing a Mets jersey or cap without being confronted by someone. They get downright angry as I found out one day as I was approached by several alcohol laden men at a convenience store after a home game. I had to figure out a way to simmer down these guys by impressing them with my knowledge of baseball stats. So, quickly I rattled off Larry Bowa’s 1980 stats …..57 runs 144 hits 16 doubles 4 trips 2 homers 39 rbi’s .267 avg and then I moved on to Mike Schmidt’s stats – down to his 12 stolen bases. It worked enough to diffuse their anger and I walked away unbruised. I’m now testing my Baltimore Orioles hat and so far, all is good. Thanks for sharing these maps. It never really occurred to me just how many states do not have a Major League team of their own and who they root for. Scott, thanks for your thoughts. But I couldn’t tell from your story, are you a Phillies fan or a Mets fan? In recent history this rivalry hasn’t been quite as prevalent because it’s been a while since both these teams were good, as you pointed to. But I bet it’ll reignite as soon as the year comes that they both fight for a playoff spot. In the meantime, I’m thinking the Nationals-Braves rivalry, which is not as geographically-fueled, will be the story of the NL East.